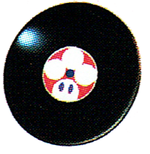 The Record is an item that can be bought from Mushroom Shop in Mario Party. It costs fifty coins to buy, and once bought, it can be used in the Juke Box in the Option House. This allows the player to listen to every song in the game: essentially, a soundtrack. This page was last edited on December 3, 2018, at 08:18.